The year 2007 has been a record of sorts as far as this site is concerned. I bought this domain and moved servers from Blogger to my own hosting sometime in early January. At that point of time, traffic was still relatively low and I was getting about 40 readers subscribing to this site. Today, thanks to your support and continued reading, traffic has leapt to no less than 10 fold and I currently have 191 loyal readers who subscribe to this site and continue to receive the latest posts I put here. This site would not be here today without your visits and I must thank you for that. Special mention goes out to Tigerfish, Rasa Malaysia, Lilian, Simcooks, Melting Wok, Reese and Babe_KL for being supporting this site and leaving lots of comments around to keep this cyber kitchen of mine lively. This site has undergone a couple of facelifts and I am quite happy with the current look. For 2008, I hope I would be able to afford a customised web site design and to double my subscribers (if you have not subscribed, why don’t you subscribe to this site through RSS or email? It’s free and you will be notified of all the latest posts here). I am also looking forward to putting up some traditional recipes including bak chang and popiah over here. It should be an exciting year ahead. If there are anything you would like to see featured here or any suggestions for this site, do leave me your thoughts at the end of this post. There are about 80 or so recipes posted in the year 2007 and some of you have been tried some of the recipes and informed me that the recipe works 😀 and that you it will feature in your family recipes from then onwards. Some of the recipes are my favourites too and today, I will feature the Best of Delicious Asian Food 2007. Definitely Hochiak! A simple no-frills sambal which is cooked by mum at home quite regularly. Good to serve with plain white rice or as a condiment to nasi lemak. My very first using of the slow cooker to cook pork ribs without the adding of water. The cooking made the meat so tender that it literally slips off the rib once you place it in your month. An absolutely simple to cook dish and very appetising indeed. A famous dish from Sarawak. It has made itself up into the 2nd most popular recipe on this site. Amazingly easy to get the taste right. Can be sinfully delicious especially when you consider the melting bits of pork leg. This is one of my mother-in-law’s specialty and it is now enjoyed by a couple of readers across the globe. A popular dessert in this part of the world and touted to be good for the health. This is one of my wife’s favourite dessert. Another one of my in-law’s recipes. The original recipe was to use duck but on that particular day, we made do with chicken as we couldn’t get ourselves a duck. Lilian tried it and she loved it. A favourite noodle dish of mine since childhood days. This noodle dish is exceptionally appetising due to the use of black vinegar to complement the noodles when serving. A favourite item used in vegetarian cooking, the recipe for Wheat Gluten was shared by our neighbour in Kuching many years back. Great when added to mixed vegetable dishes. My all time favourite cookie. 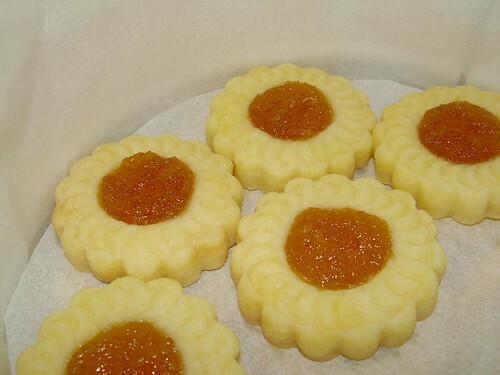 Again, I must confess that these pineapple tarts which my mother-in-law bakes are simply out of this world. Grab her recipe here and try it out. This is a commonly found dish in many chinese restaurants in Malaysia. A simple dish with the use of minimal ingredients. Guaranteed to make you ask for 2nd helpings of rice. To close of this year, it has to be the chinese stewed duck which was the most recent recipe posted. This recipe is the most popular recipe on this site. Just look at the picture. Need I say more? There you go. The Best of Delicious Asian Food 2007. A Happy New Year to You and Your Family! Bon appetit! Happy New Year to you and yours..! I’ve always enjoyed your blog..! I made your Sugar Snap Peas with Tiny Anchovies recently and I loved it, thanks for sharing! Happy New Year! Keep up the good job. I will be waiting for more Hochiak recipes from you. My family is happy I found your website. You have keep our dinner table very lively indeed. It has been a joy reading your blog! FoodFreak : I am glad you loved that recipe. It’s really simple, isn’t it? keropokman : I love your photoblog too. Having a little problem leaving a comment there though. Hi! First time dropping by here. I’ve tried your kolok mee recipe but using chicken meat instead of pork. I haven’t eaten the real kolok mee before, so I am not so sure how it ‘should’ taste. However it turned out quite yummy! 🙂 Thanks for the recipe!